Gaming chairs are the latest and greatest in gaming technology, giving you a vehicle in which you can literally submerse yourself in the gaming experience. With so many models to choose from, we’re going to make your search easier by discussing the top rated gaming chairs on the market, and highlight why these models continually prove to be more awesome than the rest. But no matter what gaming chair you choose, you’re going to be absolutely amazed by how they greatly enhance the gaming experience, and make sound, movement, and comfort more intense than ever before. When it comes to exhilarating gaming, you want to hear the game you’re playing with the utmost clarity, but you also want to feel it. With the X Rocker, you have an invitation into the world of interactive audio. 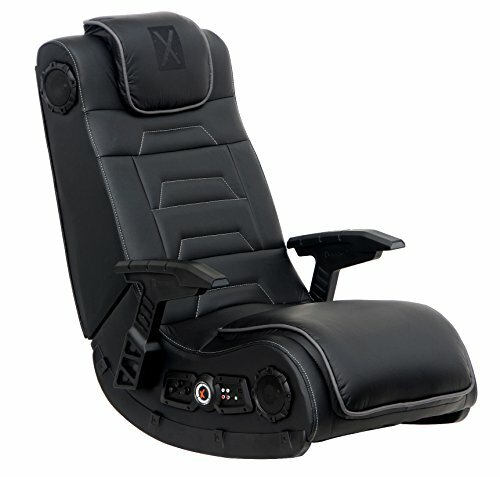 With the X Rocker Pro Series Pedestal 2.1 Video Gaming Chair you can even feel the game that you’re playing. And the chair is not only useful for games, but it’s also great for listening to music, watching a movie, or any form of media where you want to be a part of the action. There are two speakers on this chair hidden in the headrest and a powerful subwoofer that utilizes Ace Bayou’s innovative Audio Force Modulation Technology. With AFM, you get speakers and ported power subwoofers out in open space to enhance sound quality and make the experience so much more intense. 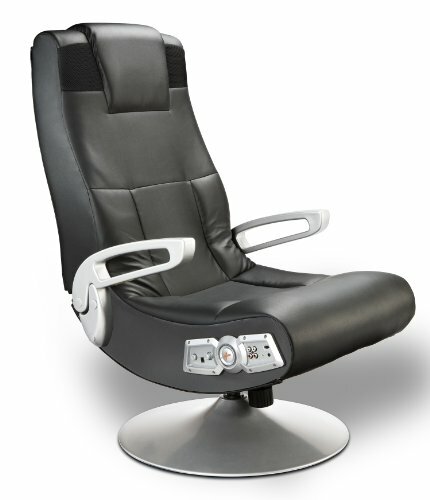 The base of the X Rocker elevates you and allows you to tilt and swivel so you can reach the utmost comfort. There are also gunshot arms which provide great support and an amazing feel. Not only is the chair incredibly powerful but it’s also remarkably stylish and cool looking. The control panel comes with separate volume and bass controls, and there are input and output jacks so you can connect to your audio source, as well as to other X Rockers when you want to play multi-player games. You’ll find that the wireless receiver is built-in and comes with a wireless transmitter to send audio to receive RCA outputs. There is even an optional RCA cable that comes included. If you haven’t experienced the world of interactive audio yet, and you seriously want to give it a try, then there’s no better place to start than with X Rocker. The Pro H3 4.1 Wireless Audio Gaming Chair allows you to not only hear music but to truly feel it in your body. This is the perfect way to get yourself in on the excitement whether you’re gaming, watching a movie, listening to music, and so much more. There are four speakers on this chair, and that is more than any other X Rocker on the market. The subwoofer uses the Ace Bayou Audio Force Modulation Technology, commonly known as AFM. This is technology that incorporates speakers and ported power subwoofers inside the chair, giving you the ultimate experience of enhanced sound. What makes the X Rocker Pro H3 stand apart are the additional vibration motors that sync with the audio bass tones, and this makes for an incredible full body sensation. You also get fixed position gun-stock arms for that added stability and heavy duty padded backrest for the ultimate in comfort. If you’re someone who likes to game for hours on end, then this chair is the solution for keeping you comfortable as long as possible. Not only is this chair highly functional, but it’s also incredibly stylish and will be a handsome looking addition to your game room decor. 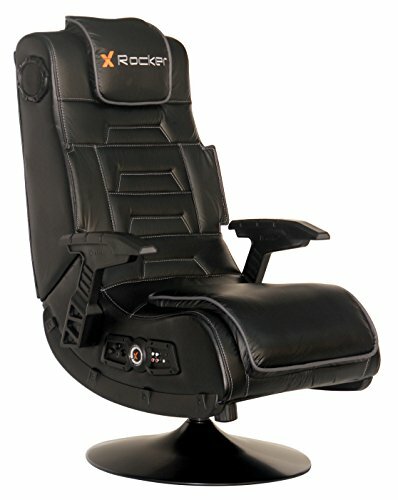 When it comes to gaming chairs, there’s really no other brand you need to consider other than X Rocker. They are leading the way when it comes to interactive audio, and this Pedestal Video Gaming Chair is a wonderful addition to the family of products. This particular model features a wireless audio system and 2.1 sound with 2 built in speakers and subwoofers. Not only is this chair incredibly comfortable and powerful, but it’s also foldable, allowing you to store it with ease and take it on the go. This chair is very easy to clean, and comes with a vinyl upholstery cover for easy wipe down. Needless to say, if you’re someone who enjoys eating while they’re gaming, then you can be sure that cleaning up your seat afterwards is going to be easier than ever. The chair connects effortlessly to most video game, audio, and video devices. What makes all X Rocker chairs stand out from the rest is that they’re also built for comfort and style. You get all the amazing sound performance in a piece of furniture that looks awesome in your home, and it is comfortable to sit in for hours on end. This chair stands apart due to its portability. If you’re someone who takes their gaming to different places in the house, or if you have multiple members in the family that like to take turns having the chair in their room, then this model is going to be just right for you. No matter what gaming chair you buy, it’s of the utmost importance that you are comfortable at all times. There are so many chair styles and features to choose from, as well as system compatibility, but there are also key components to consider before you make your purchase. This buyer’s guide is intended to help you narrow down your priorities when you’re looking to purchase the perfect gaming chair for you. Consider all the factors listed below, and also ask yourself what you’re willing to spend for the gaming chair of your dreams. The style of chair that you choose depends upon your personal preferences to a large extent. At the end of the day, it’s your backside that is going to be sitting in the seat for a number of very long games. But, even with your comfort level and preferences aside, you also need to take into account what types of games you’re going to play for the most part, and how often you plan to be sitting in the chair. All these factors will influence which chair you choose, but still keep in mind that comfort is key. Gaming Rockers: There’s nothing more satisfying that getting comfy and enjoying your favorite game. When you can recline in a gaming chair, it makes the experience all the more awesome. This is basically one part rocking chair and one part gaming control center, and these rockers are an awesome choice if you want to be as comfortable as possible while you’re gaming. These chairs are L-shaped, and the seat of the chair rests directly on the floor. Thanks to the arch of the rocker you can gently rock while you’re sitting, giving you the ultimate in relaxation. Also, gaming rockers let you sit as close as possible to the screen, putting you right up in the action. Pedestal Gaming Chairs: These chairs are ideal for those looking for a position that is a bit higher off the ground while you’re gaming, and they add a nice swivel effect. These pedestal chairs are like traditional chairs as they elevate you off the floor, and give you a straight shot at your screen. This configuration also gives you a clear view of what you’re playing, and the option to tilt and swivel. Gaming Racing Chairs: This kind of chair literally places you in the drivers seat of your gaming experience. The racing chair will come equipped with pedals and wheels which offer a realistic gaming experience that makes you feel like you’re racing, allowing you to steer what is happening on the screen. This is a hands-on driving tool, and gives you the perfect fit for flight simulations and driving games. Perfectly replicating the driving experience, you’re not going to believe how realistic it feels, and all in the comfort of your home. Once you understand the key components, and which types of games you like to play, it’s time to know all about the features of a good gaming chair. When you have the coolest features on your chair, then you’re in for the most exciting gaming experience of your life. These features will greatly enhance your gaming experience, and add to the overall comfort and performance of your gaming chair. Material: The material that covers your gaming chair is very important. You can find chairs with a variety of materials such as cloth, vinyl, mesh, and polyurethane. What fabric you choose is up to you, and what feels more comfortable against your skin. Do keep in mind that fabric and mesh are more breathable, and they’ll help to keep you cooler when gaming brings on the heat. Also, vinyl and polyurethane chairs are the easiest to wipe down and keep clean. This is important for those who snack on nachos while they’re gaming. Storage: Many gaming chairs will come with storage options such as pockets on the sides, and this makes it easy to keep controllers and other important items within easy grasp. This means that you can eliminate the time spent hunting for lost controllers. Comfy Cushions: If you’re a serious gamer then you’re going to be spending a lot of time sitting in your gaming chair, so you want to make sure you’re as comfortable as possible at all times. When choosing a gaming chair be sure to look for an extra comfortable cushion to support your bum. A good way to test comfort is to go to a store where there are many different gaming chairs that you can sit in and experience firsthand. Armrests: When you want a chair with armrests it’s important to choose one with adjustable settings to suit your comfort level, and also ones that are placed in the proper position for your body. When the rests are too high it can cause your shoulders to hunch, and when they’re too low you could hurt your posture. There are also flip-arm chairs which give you the best of both worlds, allowing you to make them disappear with the flick of a wrist. Portability: If you don’t have the floor space to keep your chair sitting around all the time when not in use, then it’s smart to get a foldable chair for easy storage. This will make it easy to keep the chair out of the way when you’re not gaming. Vibrations: The best way to really feel like you’re in the game is to find a chair with the vibrating feature. This is like a surround-sound experience with wireless headrest speakers, and it allows you to feel every jolt and impact of the game that you’re playing. An awesome way to put yourself into the character’s shoes and become fully immersed in the game, the vibrating chair is the ultimate vehicle to gaming transcendence. Owning a gaming chair is the best way to not only play your favorite games, but also to submerse yourself in them. These amazing chairs really bring the game to life, by surrounding you with sound and vibration while you play. They’re also designed for comfort, because we all know how many hours one can sit and be captivated by a game. There are so many different kinds of gaming chairs to choose from, and the buyer’s guide is intended to help you narrow down your search to the perfect chair for you. We also highlighted the top rated gaming chairs on the market, and these are the models that customers seem to favor more than the rest. When you’re ready to find the perfect chair for you, then it’s important to first understand all the best features that are available to you, and know what your priorities are.